My Y.A. novel HIDDEN ( new edition, 2014, Albury Books) was nominated for the Carnegie Medal and was Sunday Times Children’s Book of the Week, “Gripping... a book to counter bigotry.” Nicolette Jones. HIDDEN is about two teens, Alix and Samir, who rescue an asylum seeker from the sea and hide him to save him from being deported. Alix lives on quiet Hayling Island off the south coast of England and has never really thought about immigration. But Samir was a child asylum seeker and he knows how hard it is to start a new life. The book covers some of the most controversial issues of our times including racist bullying, immigration and human rights. It continues to find new audiences in many different settings. Recently one of the top South African independent schools bought 60 copies and it has inspired my work with asylum seekers through English PEN. Last year I was invited to run workshops on peace and tolerance at a lycée in the Paris suburb of Montrouge. I made my first visit in February 2014 and was invited back in October when the sister schools in this EU Peace Project, from Turkey, Germany and Spain, would also be visiting. Both visits were such an amazing experience and I have blogged about the work and the responses from the students. But perhaps the most wonderful outcome of the Paris visits was the proposal by the drama teacher, Anne Bérélowitch to create a stage play from HIDDEN for Les Terminals drama students to perform for their Baccalaureate. From workshops on peace suddenly we were discussing script, staging and how to recreate my beloved characters for the stage. Anne is fluent in both English and French. We kept in touch by email. “It is very exciting to work on your book with my students,” Anne wrote. “We are discussing whether someone can do something illegal and yet be on the side of Good and Justice... They are very interested in your commitment to world peace and understanding the Other.”Anne decided to use different languages in the play. “For example, in the rescue scene on the beach, the dialogue in Arabic will be done in Arabic.” Both Samir and the asylum seeker speak Arabic. As sections of the script were sent to me I emailed them to my publisher at Albury Books who had them checked by colleagues in France. They responded that the script was very good and properly reflected modern teen language. Anne and I were delighted. The play was beginning to take shape. HIDDEN is in effect a stream of consciousness novel and large parts of the book take place in the head of the main character, Alix. I had no idea how this would transfer to the stage. But Anne, who is a very experienced dramatist with her own theatre company, had a brilliant device. “I have included a chorus (3 to 5 actors) who act as Alix's consciousness, creating both emotion (for instance when she tells us how she misses her dad) and distance (in the Brechtian sense). Could you tell me if this appeals to you?” To be honest, I had no idea. But I trusted Anne’s vision and the chorus proved to be a triumph. Their performance was electrifying and I had to hold back the tears: the chorus, the break dancing, the attack on Samir by the gang, the music, the humour, the creation of the sea off Hayling - I loved the entire performance. The cries of Bravo echoed round the theatre as the cast lined up to take a bow. The character of Samir was played by Samih Hazbon, who arrived from Syria as an asylum seeker two years ago, speaking no French. His English is fluent and he attended my workshops on peace last year. It was a very powerful moment to see him play Samir and deliver the Arabic dialogue. The honour and privilege was all mine. 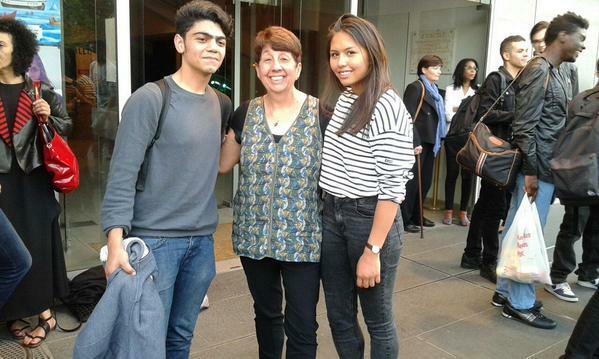 A huge thank you to Anne Bérélowitch, her students and Theatre 71. Miriam Halahmy has been a SCBWI member since 2007. She has published four novels and three poetry collections. Miriam writes for children, teens and adults. 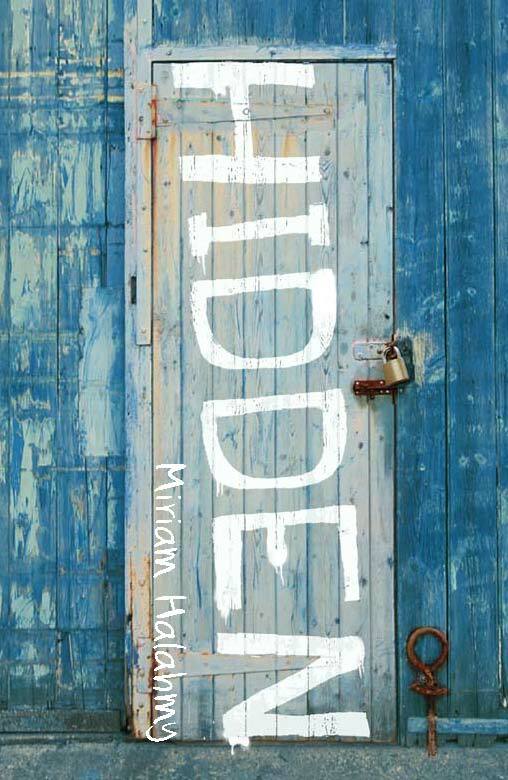 Her first YA novel, HIDDEN, was Sunday Times Children's Book of the Week and nominated for the Carnegie medal. She is currently working on a MG novel on kids, pets and WW2. Miriam is a frequent speaker and workshop facilitator at festivals, conferences and in schools and colleges. She also mentors developing writers and supports asylum seekers through English PEN. She loves to walk, paint, travel and look after her new grandson. What a fantastic experience! it's such a good book. Thanks Sue, it was a wonderful night. Many thanks Candy. It was an incredible experience. How wonderful. I haven't read Hidden yet. Looking forward to it. Let me know what you think Moira and thank you for your interest. Such a huge impact Miriam - congratulations! I loved writing the article Louise, it really gave me a chance to process the whole experience.